Go "clubbing" like never before! 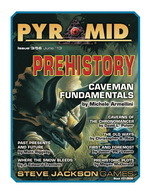 Unleash your inner caveman with Pyramid #3/56: Prehistory, the latest issue of Pyramid. This installment provides GURPS templates and options for cave-dwelling heroes, new Ritual Path Magic spells for primitive practitioners, prehistoric-themed adventures and plot seeds (including a GURPS Dungeon Fantasy adventure by David L. Pulver), and more. It also unleashes a new character-building option from GURPS Assistant Line Editor Jason "PK" Levine, letting you be the first person in the world with a new skill or ability! What campaign can't benefit from having a visit from our great-great-great(...)grandparents? Pick up this issue individually, or start your subscription today and protect the future!